The EA uses the top market signals algorithm. 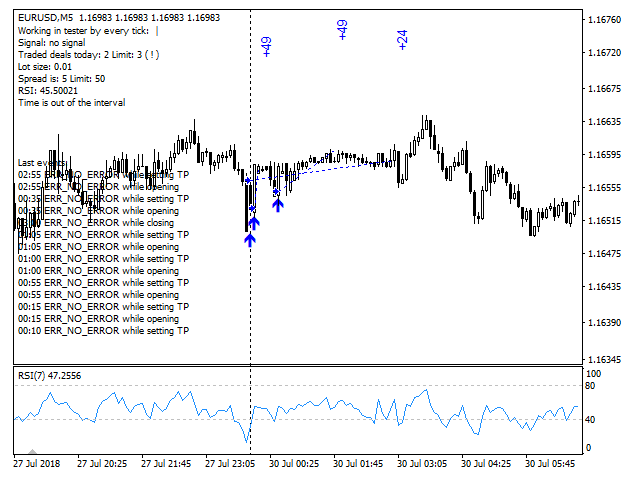 It opens trades by RSI indicator signals in a specified time interval. In the case of a repetition of the signal opens a unidirectional transaction. The number of transactions per day can be limited. Revolves trades on the opposite signal. Trailing stop loss order. Displays information on trade and its results. Also you can set virtual stop loss and take profit. Break even function is available. Happy for now, lets see how it continues. Just Bought and installed on Alpari PRO ECN and ICM. We hope well!! 5 Stars for assistance of author! The strategy is steady and unique, and it seems to be very effective so far. Update: 16,Mar,2019 Sorry now I don't use this. cause author ignore me in a forum. This EA is one of the best night scalpers so far. It opens trades just between 1 and 3am (gmt +2) and closes all open trades at 3am, so you won't have any open trades during London Open. Therefore it cuts losses short. It is a brilliant strategy and recovers losses very quick. I have been running it for 2 months so far and am very impressed by the results! Vladimir joined our telegram group and is very helpful and very open for improvement and new ideas! - The EA went through a dip last week but is cooking this week, it recovers very quickly from losses. Those who complain are either looking for the holy grail which does not exists or they trade at too high risks. Look at the author's live accounts, what more do you want? Just Bought the EA. Lookin' good and havin' fun so far! I have this EA now for one month in use and it works very well. The Author is very helpful and add wishes very fast. So until now i can recommend this EA. Very promising ea! At the moment the ea is making profit every night! The author is present and willing to implement changes when necessary !!! Congratulations Vladimir ! Good product! Sentiment indicator is added into the EA. Watch video manual about using it. Back testing results writing is improved. The file is a text file and can be read in Excel for building graphs. The function is described in more detail in the video. You can set a ban on the opening of new transactions if the end of the trading session is less than the time specified in the parameter - Do not open new deals if left (minutes). Also at this point in time, you can set the transaction to breakeven - ...and place SL at break even + pip(s) (if 0 do not use). 1. When the function of closing trades by exit from the specified time interval was disabled, the EA continued to close trades by the reverse signal from the RSI indicator. Corrected. Closing ouside the time interval will occur only by the take, stop or reverse signal during the next trading session. 2. 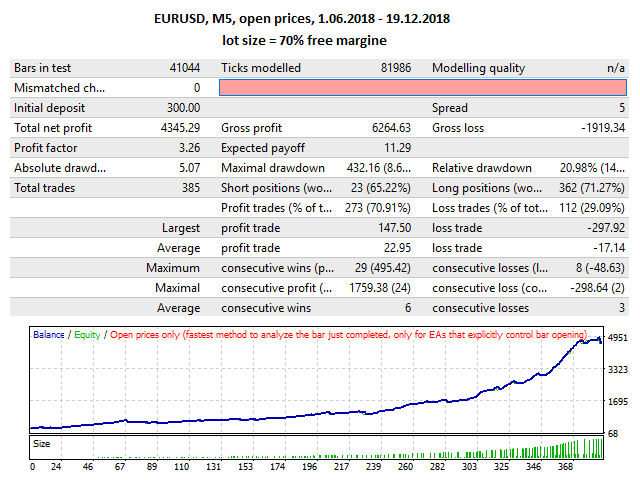 During the next trading session, the expert Advisor keep opennig trades by signals even if there were still opened trades from previous sessions. Thus, the allowable number of transactions was exceeded. Corrected. 1. You can specify one valid trade direction - buy or sell. By default, the EA is allowed to open trades in both directions. 2. Added ATR filter. If the ATR value is within the specified range, the EA is allowed to open trades. The filter can be disabled by setting Period=0. You can disable deal closing by End time if stop loss is being trailed in the profit zone. 1. Added trailing step of stop loss order. If 0, then step not is used, and works the usual trail. 2. Added transfer of stop loss to breakeven after reaching the specified profit. 3. If you are allowed to open several trades in the same direction by the signal, you can set a limit on the minimum distance between them by the number of bars of the RSI indicator timeframe. 4. The lot size can be set without adjusting the balance. 1. It is possible to set no trading days by the list: 1 - monday, 2 - tuesday etc. For instance. 35 - do not trade at wensday and friday. 3. Do not delete trading results from the chart after backtesting with visualisation. 1. Minutes were added to time interval. 2. Stop loss and take profit could be set as virtual (brocker will not see it). In this case made them negative. 1. Added the display of the spread on the chart at the time of opening the transaction. 2. Shows the time boundaries of trade. 1. Added a function to prohibit trading if the spread exceeds the allowed level. 2. Added stop loss trail. 3. In the case of setting the deal volume with a constant lot value, the deal volume will be increased linearly if the RSI value is closer to the extreme values ​​of 0 or 100. At these boundaries, the lot value is specified by the Size at RSI limits parameter. 4. 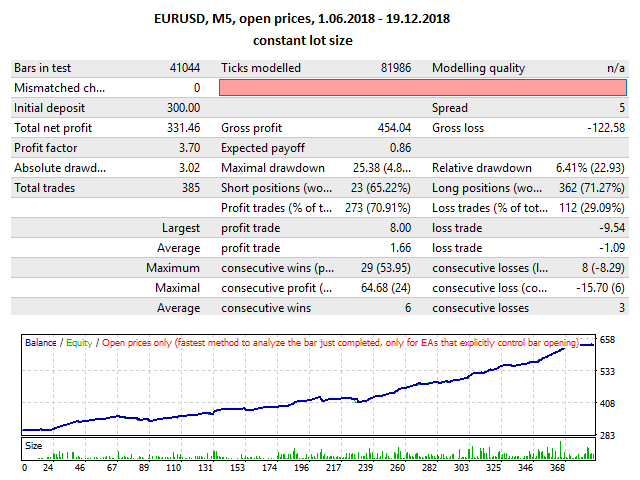 Added display on the chart tool additional information on the settings and trading results. The arrows indicate the direction of transactions, the lines of their duration, and the digital value - the profit / loss. 1. Closing by the End hour - yes / no. 2. Opening an additional deal when the signal is repeated on the following bars - yes / no. 3. Closing a deal on the opposite signal - yes / no.